The Hanoi Taxi is a Lockheed C-141 Starlifter strategic airlift aircraft (Serial Number 66-0177) that was in service with the United States Air Force and became famous for bringing back the first returned prisoners of war in Operation Homecoming. Introduced to replace slower piston-engined cargo planes such as the C-124 Globemaster II, the C-141 was designed to a 1960 requirement and first flew in 1963; production deliveries of an eventual 285 began in 1965, 284 for the Military Airlift Command, and one for NASA. 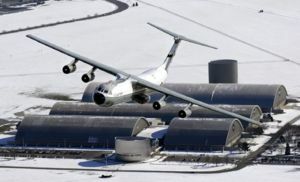 This aircraft, which was delivered to the Air Force in 1967, was the last C-141 to be withdrawn from service after a career of almost 40 years, as the last of the fleet was retired in 2006 as sufficient C-17 Globemaster III aircraft became available in the regular Air Force to allow C-141s still serving with Air Force Reserve units to be replaced by the C-5 Galaxy aircraft being seconded from the regular Air Force. For much of the late 1960s and early 1970s, 66-0177 flew out of Norton Air Force Base, San Bernardino, California with the 63rd Military Airlift Wing (MAW). The Hanoi Taxi flew Bob Hope to USO shows in South Vietnam. The Hanoi Taxi was used in 1973, in the final days of the Vietnam War, to repatriate American POWs from North Vietnam. Arizona Senator John McCain was one of the POWs who flew home on the Hanoi Taxi. The Hanoi Taxi's name comes from the writing on the flight engineer's panel by the POWs aboard the plane for the freedom flight. In 2002, when this aircraft was upgraded to a C-141C, the Air Force repainted it in the same white over grey livery as it wore in 1973 . Signatures of the freed prisoners have been preserved on the panel over the years and are the centerpiece of what is essentially a "flying museum." Plaques, documents and photographs of the homecoming are part of the on-board exhibit researched and created by the 445th Airlift Wing. Etchings of the names of those who are missing in action were taken from engravings on the Vietnam Veterans Memorial in Washington and are mounted on the plane. Framed photographs, plaques, and other memorabilia adorn the interior. The aircraft has been exhibited to the public at the Dayton Air Show and other venues. In 2005, Hanoi Taxi was one of the aircraft marshalled by the Air Force to provide evacuation for those seeking refuge from Hurricane Katrina. This aircraft and others evacuated thousands of people, including the medical evacuation (MEDEVAC) of hundreds of ill & injured. At the end of its career as at the beginning, this aircraft brought Americans out of a hostile environment and back to safety. This page was last edited on 6 March 2007, at 09:52.